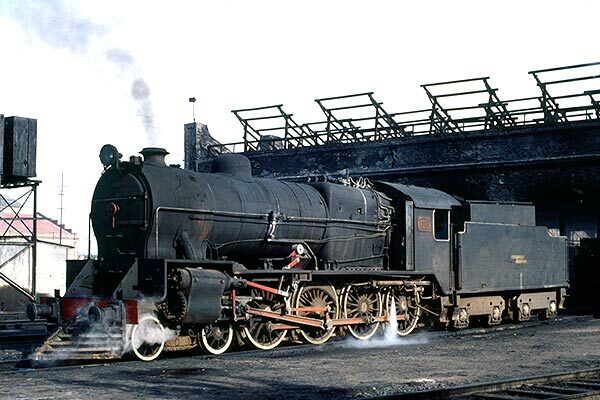 Caption - F C General Roca (Argentina) class 15B 4-8-0 no.1585 is seen at Tandil loco shed in 1977. The 15's were built in several batches by Vulcan Foundry in the UK and follow general British practice of the time. This loco was delivered in 1949 and is 5-foot 6-inch gauge. The class was originally designed for the British owned Buenos Aires Great Southern Railway (BAGS) before the Second World War. This railway was one of a number nationalised by the Peron Government in 1948 when the BAGS became the General Roca division of the Ferrocarriles Argentinos.